New York streets are congested with traffic and the subways are crowded. The congested roads are leading to an economic loss for New York City as well as contributing to air pollution. In addition, overcrowding on the subway not only causes personal discomfort, but puts extra demands on a system that is already operating beyond its original capacity. Our initiative is to get more people biking for transportation in New York. 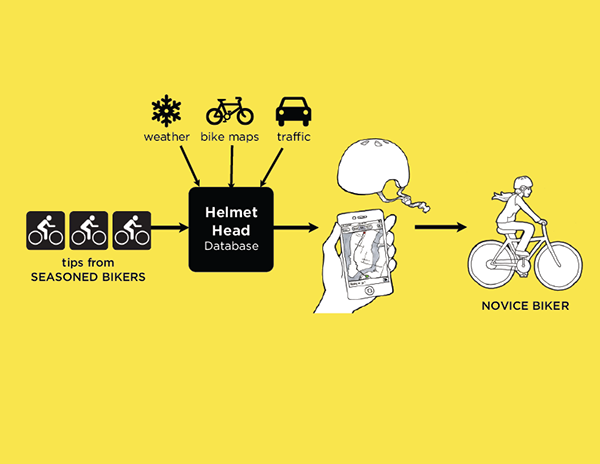 It has three primary functions—(1) delivers tips from seasoned bikers, (2) helps navigate safe bike routes and (3) gives encouragement relevant to the ride. The video above demonstrates a typical user journey. Our research involved nine interviews with beginning and seasoned bikers. It revealed three key findings that informed the design—(1) People have the perception that biking in Manhattan is dangerous, (2) Biking is not the easiest and most convenient way to commute until it becomes a habit and (3) Novice riders don't have enough knowledge about how to bike and where to bike in the city. We believe that the more people we can get biking in New York, the safer the city will be for bikers. In addition, once Helmet Head becomes pervasive, New York City can use it as a tool for counting bikers. This data would help advocate for and inform new bike initiatives.